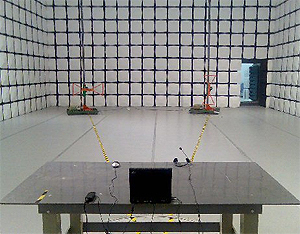 We bring you various kinds of anechoic chambers, from pre-compliant to full-compliant chambers. Anechoic chambers are categorized as "Semi Anechoic Chamber" or "Fully Anechoic Chamber", where latter has absorbers on every internal surface of the chamber. We use Emerson&Cuming Anechoic Chambers' products, who has one of the longest history of absorbers in the world, for the absorber materials to realize reliable and high performance anechoic chambers. Customer can select best fit Emerson&Cuming Anechoic Chambers absorbers not only for anechoic chambers but also for small anechoic boxes. * Base size 61cm x 61cm for all models. * Each value shows the reflectivity of plane waves exactly vertically irradiated the absorbers. We supply only the absorber materials. Please contact us for details. - Standard: CISPR22/25 EN FCC etc. * Measurement distance may differ according the the regulation applicable to countries or standards. Smaller size than compliant chambers. Sufficienty site attenuation performance to be used for pre-test of customer's EUT. Possible to be installed in building office floor. 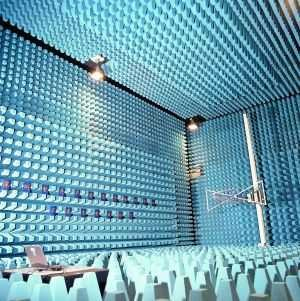 We supply best fit fully anechoic chamber for EMI pre-test. Please contact us from here for more details.